Honey Badger don’t care. Now that I’ve said it, can we get on with the review? 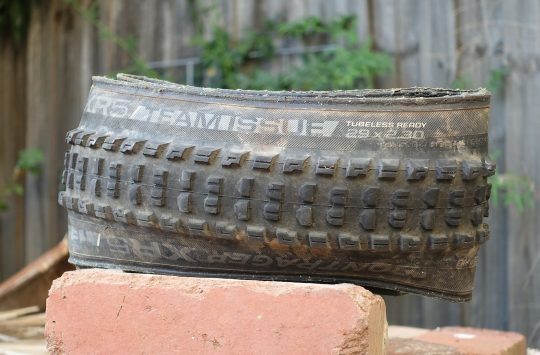 Ahem… There’s a nice burly feel to this tyre, weighing in at a solid (but not too hefty) 997g, just 20g over the quoted 977g. Kenda’s Light Gravity Casing has a generous 120tpi, the ubiquitous protective grid across the sidewalls to reduce the chance of slashes and punctures, and a 42a/50a compound, paired with widely spaced and chunky knobs for traction. Kenda’s Honey Badger DH Pro is a burly 2.4in wide tyre for trail and enduro riding. 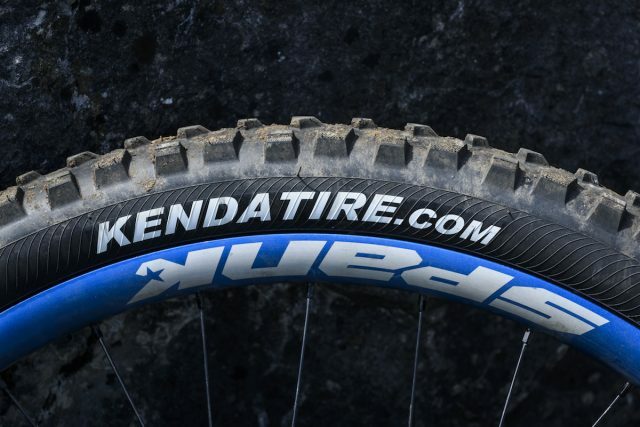 According to a graphic on the Kenda website, the Honey Badgers are designed to work best in everything from loose dirt/sand to hard pack, and we should only expect them to start struggling in swampy mud, while markings on the sidewalls let us know that they should be run between 30-50psi (which we promptly ignored and ran them at 25psi front, 28psi rear). If you’re so inclined, they are also available with an EMC casing, which has been specifically developed for e-bikes and is rated for use up to 50km/h! 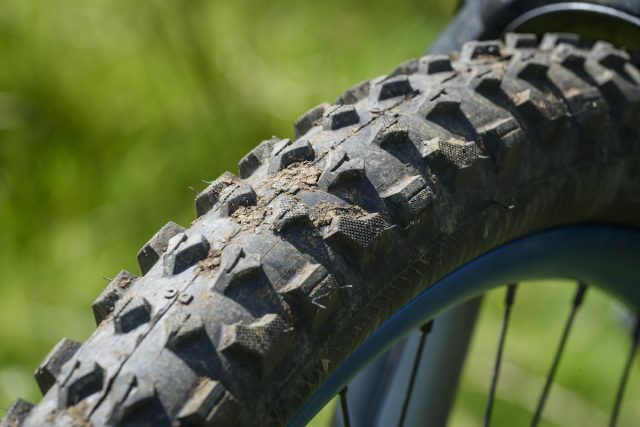 Coming in just under a kilo per tyre, the DH Pro straddles the weight of a lightweight trail tyre, and a heavy-duty downhill tyre. Strong edging blocks deliver excellent cornering manners. 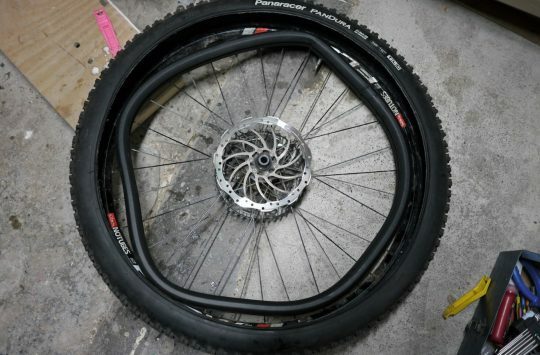 They went up fine using an Airshot tubeless inflator on Stans Arch MK3 rims, although on slightly wider Spank Oozy 345 rims they were trickier to mount, but did eventually seal (without the need for a compressor). We didn’t notice any air leakage once up and there was no seepage through the burly sidewalls. With a soft compound and lots of space between the knobs, there was a bit of drag when climbing, but this was to be expected, and the pay off was great climbing traction – the Honey Badgers didn’t slip or spin out when climbing, unless conditions were super loose or muddy, and wear was pretty respectable too. Having said this, we would definitely consider pairing one up front with something a bit faster rolling out back to reduce the draggy feeling. Because of the open and blocky profile, the Honey Badger DH Pro tyres don’t roll particularly fast. Cornering was good, and we never felt them drift unless conditions were really muddy, with the soft compound side knobs doing a great job of keeping traction, even over wet roots or rocks. 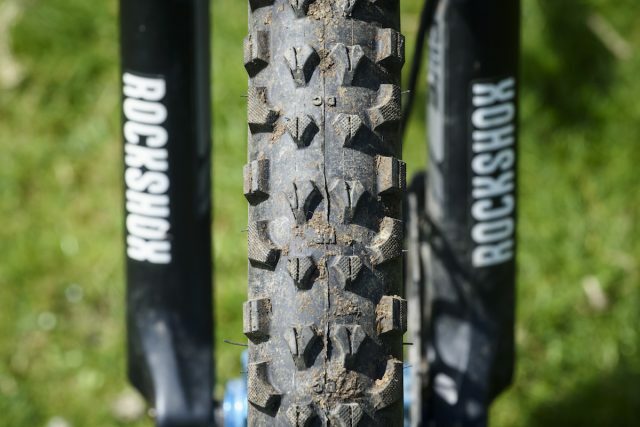 In truly deep mud, the knobs just aren’t deep enough to dig through and find the grip, but seeing as they aren’t designed to work in those sort of conditions, it seems slightly unfair to penalise them for it. On dry rock and gravel, the level of traction was impressive and under braking the tyres refused to skip or jump around, slowing you down precisely when you needed them to. We did manage to put a small slash in the rear tyre on our second ride out, on a rocky pitched descent deep in the heart of the Lakes, but this was most likely due to either a combination of bad luck or bad line choice, and sadly it was just a little too big to seal with tubeless gunk so a tube went in for the remainder of the ride. Back in the workshop we managed to fix the hole with a tyre patch, and it hasn’t given us any grief for the remainder of the test. 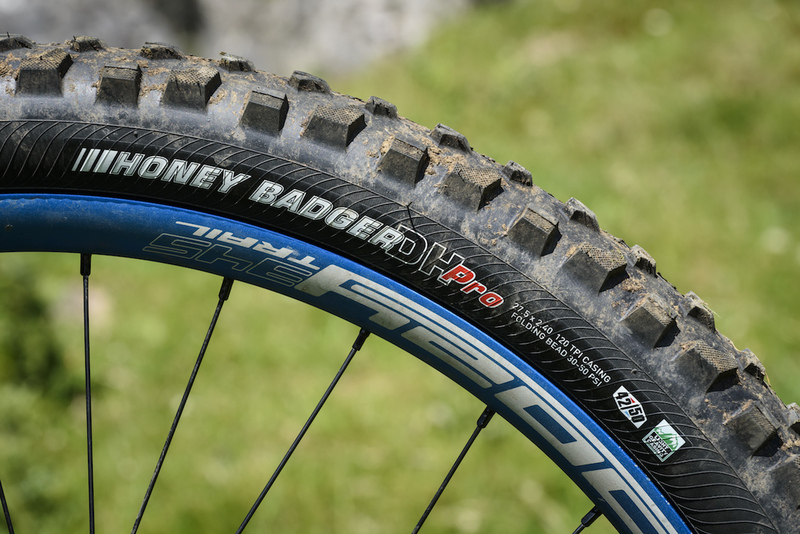 After fixing a single puncture early on, the Honey Badger DH Pro tyres have gone on to perform reliably ever since. 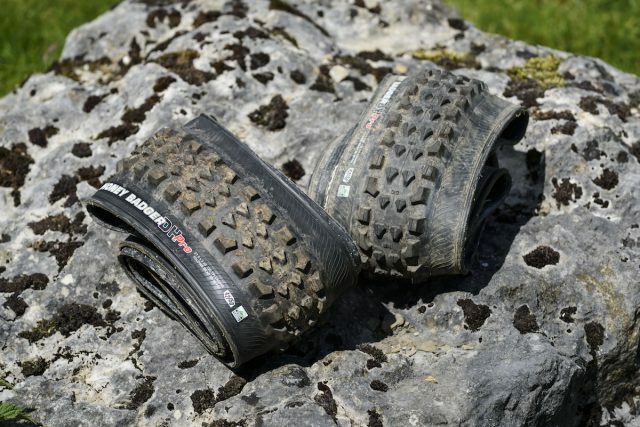 Compared to the hugely popular offerings from Schwalbe or Maxxis (Magic Mary or High Roller II), the Honey Badger has slightly less grip in sloppier conditions, yet more than holds its own elsewhere. 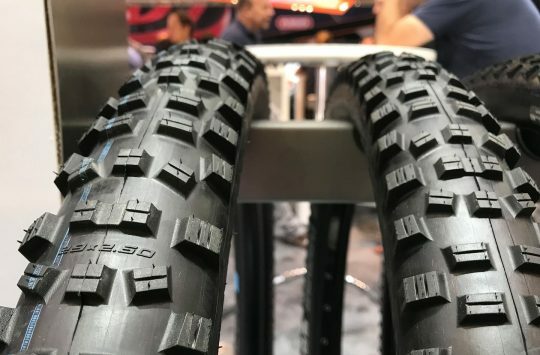 It’s only let down by being just a bit too slow rolling for general trail riding and putting the miles in, but if absolute efficiency isn’t high up on your list of requirements and your riding errs towards the more gravity end of the spectrum (or you’re just in need of some extra resistance training for next season), then these are a great, oft overlooked alternative.